An ISPFCU Fixed Rate Home Equity Loan is a great way to take advantage of the equity in your home and to ensure you have funds for whatever you may need, such as home improvements or college tuition. An ISPFCU Fixed Rate Home Equity Loan is available for up to 80% of the value of your home minus your first mortgage balance. With a Fixed Rate Home Equity Loan you can rest easy with predictable monthly payments and have the funds given to you in one disbursement. An ISPFCU Home Equity Line of Credit is available for up to 75% of the value of your home minus your first mortgage balance. With a Home Equity Line of Credit your monthly payments may vary based on the current variable interest rate and how much you have borrowed from your available limit. However, a benefit of having a Home Equity Line of Credit is the flexibility of advancing money up to your available limit for any purpose at any time. 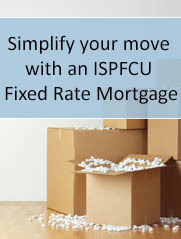 Another great benefit about an ISPFCU Fixed Rate Home Equity Loan is that your interest charges may be tax deductible. We recommend consulting a tax advisor regarding the deductibility of interest. If you have any questions about an ISPFCU Home Equity Loan or would like more information please contact a member of our loan department at 800-255-0886.